If you are not 100% satisfied with your purchase, you can return your order to the warehouse for refund (less shipping). If for whatever reason you're not happy with your purchase, just return them in their original condition to our warehouse address. With ATees' 365 day return policy, there are no special catches or exceptions. All we ask is that you send the items back to us in the original packaging, and make sure that the merchandise is in the same condition. Shipping fees are non-refundable once the shipment is packaged and shipped. If your order qualifies for free shipping, the actual shipping fee will be deducted from the return amount. A 10% restocking fee will be charged if an order is placed and canceled at a later date. Once your return is received and inspected by the fulfillment centers (usually within 72 hours of receipt), your refund will be processed and a credit will be automatically applied to your original method of payment within 7 days. Please note that depending on your credit card company, it may take an additional 2-10 business days after your credit is applied for it to post to your account. 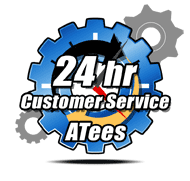 Thank you for visiting ATees.com! 852-2886-0618 or Email our Customer Loyalty Team - we reply to emails lightning fast.